Pengguna jalan tol menempelkan kartu e money di gardu tol. INDUSTRY.co.id - Jakarta - Coordinating Ministry for Economic Affairs, Ministry of Public Works and Public Housing (PUPR), Bank Indonesia together with all relevant Ministries / Agencies continue to strengthen coordination to improve efficiency and quality of toll road electronic payment services throughout Indonesia. In addition to the implementation target of toll road electronics payment system, the next target is to provide non-toxic services for all new toll road sections to be operated. Furthermore, there will be integration between all toll roads and non-toll transactions on toll roads using touch-based technology (toll payment transactions made without physical contact with toll transaction equipment) which is planned to be implemented by the end of 2018. "Several toll roads have already applied electronication before October 31, 2017 in accordance with the Minister of Public Works Regulation concerning Non Toll Tariff Transaction on Toll Road which requires at the end of September already 60 percent of toll gates applying electronic transactions," said Coordinating Minister for Economic Affairs Darmin Nasution at the Meeting Coordination of Toll Road Electronication, Friday (6/10), in Jakarta. Present at the meeting was the Governor of Bank Indonesia Agus D.W. Martowardojo, Minister of Transportation Budi Karya Sumadi, Minister of Communications and Informatics Rudiantara, Head of Toll Road Regulatory Agency Hery Trisaputra Zuna and related officials. The implementation of 100% toll road electronication in October 2017 is executed as mandated by the President of the Republic of Indonesia and has been set forth in the regulation of Minister of PUPR Regulation no. 16 / PRT / M / 2017 dated September 12, 2017 concerning Non-Ticket Transaction on Toll Road. Since 2017, relevant ministries and agencies have undertaken implementation preparation steps. Darmin said that the toll road electron- ity agenda in Indonesia is so important considering the ultimate goal of developing the toll road in the form of the application of Multi Lane Free Flow (MLFF), ie toll-free payment process (toll road users do not have to stop the vehicle at toll gate) so payment transaction becomes more efficient and smooth. "The stages towards MLFF development must be preceded by the realization of the behavior of toll road users who are familiar with non-cash payments, such as the use of electronic money and through intensive socialization at the national level," said Darmin. In addition, there is also a non-cash payment infrastructure that is integrated between the toll roads and interconnected and interoperable among electronic money publishers. To realize the plan, Bank Indonesia and the PUPR Ministry have developed a joint strategy to develop toll road electronics through 4 stages. First, the electronification stage of the entire toll road in October 2017. Second, the integration phase of the toll road system. Third is the phase of integration of toll roads and the establishment of Electronic Toll Collection Consortium (ETC). Fourth is the application of MLFF in all toll gates. This strategy has been derived in the form of an action plan. 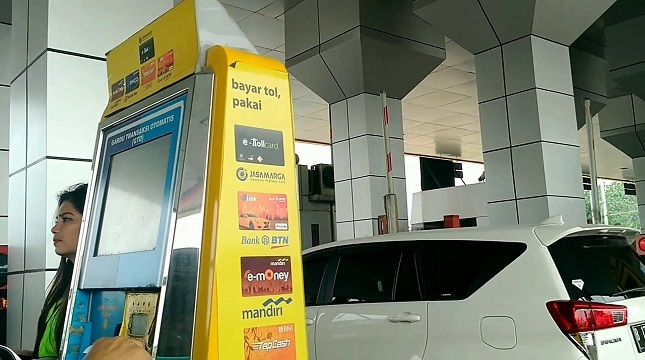 Agus added the payment infrastructure interface in the form of electronic money reader which is now implemented requires harmonization between banks and Toll Road Enterprises (BUJT) and various parties in its implementation in the field. Furthermore, coordination efforts should be made to succeed transition of non-cash transaction behavior from toll road users. The government procures toll road electronics or 100 percent non-cash payment on October 31, 2017 which requires banking commitment in maintaining the availability of electronic money cards as well as BUJT and banking commitments in accelerating the integration of new electronic money issuers. As of October 4, 2017, the penetration of electronic money usage on toll roads reached 72%. With toll road electronics, toll road payment services are faster, more practical and convenient to improve efficiency and smoothness on toll roads.